After three long months, WP Security Audit Log version 3.0 has finally arrived. The most recent version of WordPress’ most comprehensive and complete activity log solution features a new licensing model & mechanism, new alerts, several updates and bug fixes. Here is a highlight of what is new and improved in the latest version of this plugin. Business – the same as the Professional Edition but also with priority support and account manager. For more details on the new licensing mechanism, such as when the existing customers will be migrated, read the post 2018 – New Licensing Model for the WP Security Audit Log WordPress Plugin. If you have any questions on the new licensing mechanism please do not hesitate to contact us. 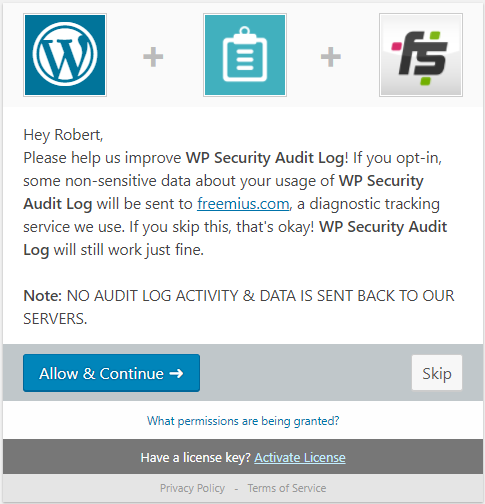 In this release of WP Security Audit Log plugin we also included Freemius, which will allow us to provide free trials, better manage our licensing program and accept credit card payments via a new payment gateway, not just PayPal payments. Freemius will also give us the functionality to better understand our users and how they are using our plugin, thus helping us in continuously improve the plugin and make sure it meets all of our customers’ requirements. You can read more about Freemius in What is Freemius and How Do We Use It. Note that opting in is optional and should you choose to not opt-in, the plugin will still work. Also when you opt-in to send us diagnostic data, NO audit log and user activity is sent to us. Plugin now also captures the status and created date of a post. This data is needed to implement new features in future versions. Updated the Italian translation files. All of these improvements along with a number of a handful of bug fixes help make the WP Security Audit Log plugin better than ever before. The update of version 3.0 is available today and can be installed directly from your WordPress admin Plugins page. Should you have any queries or require any assistance, do not hesitate to get in touch with us. If you have been using the WP Security Audit Log plugin please send some stars our way! Spare a minute of your day to rate our plugin. We really like stars!